Life-changing events happen where we least expect them and we often don’t realise how much of an impact they have on our lives until long after the event. As the sun sets on another Edinburgh Marathon Festival weekend, I want to share with you the most amazing 2 days in May I had 4 years ago that has had the most incredible impact on me personally and professionally. It was the weekend I did ‘The Hairy’ and ran the 5k, 10k, Half Marathon and Marathon at the 2014 Edinburgh Marathon Festival. I can’t quite remember where the idea to do this came from but it was to become the focal point of a fundraising challenge my wife Allison and I wanted to do for Macmillan Cancer Support after losing my Dad to oesophageal cancer in 2013 and in memory of her grandparents who both had cancer. We had already planned to do the Paris and Loch Ness Marathons and I wanted to cover around 1000 miles between the events. Most people who know me, know that I’ve been running a marathon almost every year for the last 20 years and so they’re not that impressive in terms of making a difference with fundraising and so I needed something different. Something that would represent a great challenge to me. Something that would get me out of my comfort zone. Doing the 4 races in Edinburgh would do just that and also eat into the total miles I had to run so all good! 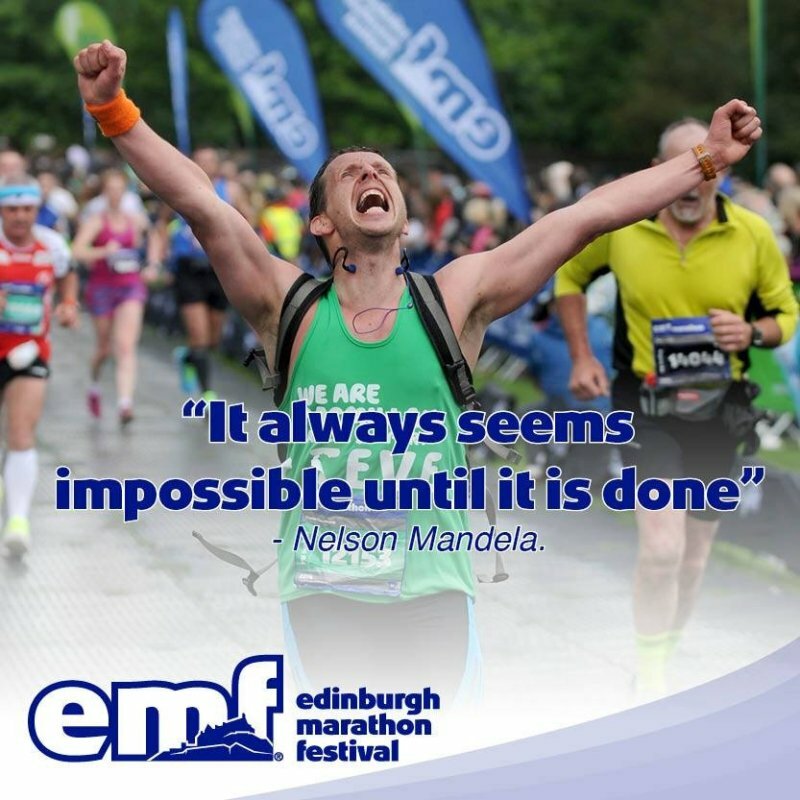 After chatting to a friend, Mark, who had completed the 4 races previously, I discovered that my challenge was to become even bigger as due to timings and logistics, I would need to race the Half Marathon and finish close to 1 hour 30 minutes and then arrange for a lift on a motorbike in order to get back to the centre of Edinburgh in time for the start of the Marathon. The Half Marathon started at 8am, the Marathon started at 10am and it would take around 30 minutes to get back from Musselburgh as the shortest route was the road the race was being run on. Running a Half Marathon followed by a Marathon was going to be hard enough without the thought of having to race the Half Marathon first. Not only that, to get close to 1 hour 30 minutes was going to require me to run close to a Personal Best. No pressure then! The event festival was spread over 2 days, the 10k followed by the 5k on the Saturday then the Half and Marathon on the Sunday. I knew I could do the 2 races back to back on the Sunday as I raced a Half Marathon a few weeks before and as soon as I crossed the finish line, I had to ask myself if I could keep going and the answer was yes. Another challenge I hadn’t thought of was the logistics of having 4 race numbers, 2 vests and an array of gels and drinks I was going to need over the 2 days and to be able to arrange them in a way that was easy to manage. Another thing I hadn’t considered was how I was going to pace the 10k and 5k. Would I take them both easy and save energy for the next day? I thought of this as I stood on the start line of the 10k and before I came to any conclusion, the gun went off and I found myself racing it. Oh well. The route involved a loop of Arthur’s Seat in the first half and I was obviously consumed by excitement of the weekend ahead of me as I managed to smash my 5k PB by 30 seconds in that first half before finishing in 41:33. Instead of thinking that I should maybe take it easy in the 5k, I found myself wondering if I could run even faster seeing as I ‘only’ had to run 5k. Turns out the answer was no as I ran it in 20:39. Still a quick time! The night before a marathon is usually when you get your kit laid out for the next day. In this case, I had 2 vests to arrange with race numbers and the gels and drinks I would need for both races and between them. There’s always a mix of nerves and excitement and this was a bit more amplified as I was preparing to do something I had never done before and I was already on a high from the races earlier in the day. Getting to sleep was going to be fun! Morning came, forcing down porridge at what felt like the middle of the night and it was off to the start of the Half Marathon, checking my kit for the millionth time to make sure I had everything and had the correct vest and number on for the race. With my bag on the bus, now it was time to get going. I don’t remember much about the race other than the fact that it was raining before we started, which was quite refreshing, and wondering how I will feel having to run this route again a couple of hours later. I was focused on the race and making sure my pace was on target. I remember crossing the finish line in 1:33:58 then continuing to run to collect my medal, goody bag, bag from the baggage truck, change my vest and go meet my friend Fraser, who was waiting with the motorbike. I knew I had a job to do and that time was critical so no time to stop and think about the race just completed. The journey back was a bit fraught as we got into heavy traffic, hit every traffic light at red and so by the time we got back to the centre of Edinburgh, it was already after 10.15am, meaning that I had to sprint to the start line as I started to see the crew beginning to dismantle the start area. When I finished the half, I asked the race crew to radio ahead to say that I was on my way and managed to cross the line before they lifted the timing mats. What a relief! The marathon turned out to be the easiest I’ve ever run as the pressure was now off and all I had to do was get to the finish. I had thought of aiming for under 4hrs 30mins but it wasn’t important if I got it or not. Crossing the line was all that mattered. When running a marathon, I always break it down by either the distance or by landmarks so it becomes easier to focus on smaller chunks than the 26.2 miles. In Edinburgh, this can be easy by thinking about getting to each leg of the relay with the Macmillan cheer points as a bonus. This is always a great strategy as running 26.2 miles can feel daunting but if you can break it down into smaller chunks, pass one then focus on getting to the next one and it can feel a lot easier. I got to 16 miles and felt fatigue kick in for the first time. The lateness of getting to the start had created a great distraction for me as had chatting to a few people on the way round but now my body was feeling the whole weekend catching up and my mind started playing tricks on me by telling me to stop and walk. I walked a little bit but started running again. I didn’t want to stop as I knew it would be harder to get going again. The Macmillan cheer point at mile 18 was a godsend. They were amazing and gave me a massive boost. I remember chatting to a guy I recognised from the gym I used to be based in, he was running his first marathon and was beginning to struggle so I kept chatting to him and creating distractions for him by relating the last few miles we had to run to a couple of laps of the North Inch in Perth. That seemed to work for him and it was also a great distraction for me as all I wanted to do was get to the finish. I passed through another cheer point at mile 22 and the hug I got from Shirlie, the Macmillan fundraising manager, gave me another boost. The last 2 miles were the toughest I’ve ever experienced in a marathon. I had to dig deep and use every bit of self-talk I could think of to keep me going. I reminded myself of why I was doing it and that helped a bit. I tried thinking that I was now just over a lap of the North Inch to go but that didn’t work quite so well. I find music with motivational lyrics useful in running and so I started reciting a line from one of the key songs I had been listening to in training. The song was Not Giving In by Rudimental and the line was “This time, I’m gonna be stronger I’m not giving in”. To me, this line sums up getting through the last stages of a marathon. You’re tired but you don’t want to stop. This worked a treat. We turned one final corner and the finish line was within touching distance. I then recited the line I always recite at this stage of every marathon – “Here I go here’s my shot, feet fail me not cause maybe the only opportunity I got” from Lose Yourself by Eminem. I encourage everyone running a marathon (or any other distance) to give it their best shot as it may be the only race they ever do so to make sure they have the experience they want to get from it and to be able to tell people afterwards. With the words going round in my head, I summoned up every last ounce of energy I had and made a sprint for the finish line. As I got closer, I raised my arms and let out a massive cheer, as if I had won the race. I was finished. I didn’t have to run anymore. I had won my race. I cried. I had just completed the hardest thing I’ve ever done yet it felt like the most amazing experience ever. I had been on a high all weekend and it took a few days afterwards for that to subside especially as the photo of crossing the line went viral and I still feel every bit of emotion from the race every time I look at it. What have I learned from doing the 4 races in Edinburgh? It is never a case of ‘can or can’t I’ but ‘how it will be done’. If the dream is crazy enough to excite you, you will find a way to do it. I can do anything I set my mind to do. When you get your mind focused on the goal, the journey to get there becomes magical. Strength of mind overcomes ability. The hardest bit of it all, physically, was running the required time in the Half Marathon. Courage, belief and determination will get you through anything when your head is telling you to stop. What would you love to be able to do that fear and a lack of self-belief is currently stopping you from doing?